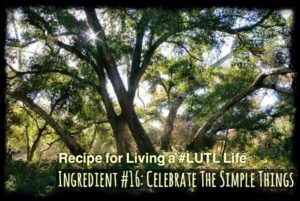 The 16th Ingredient in the Recipe to Living a ‪#‎LUTL‬ Life is to “Celebrate the Simple Things.” This is a fun ingredient because you get to choose what makes you feel good. And here is a tip — the simple things count! Nature, animals and children provide an abundance of opportunities to enjoy. Appreciating a beautiful sunrise or sunset is always at the top of the list! Be present and always do your best to “stop and smell the roses.” Remember, it’s a choice. This entry was posted in The Movement and tagged #LUTL, celebrate, light up the love. Bookmark the permalink.